In 1961, a black veteran named James Meredith applied for admission to the University of Mississippi — and launched a legal revolt against white supremacy in the most segregated state in America. 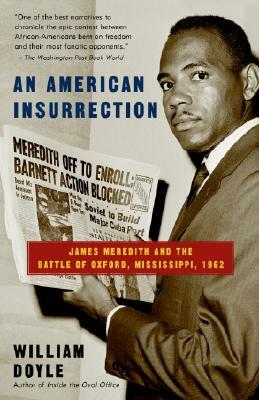 Meredith’s challenge ultimately triggered what Time magazine called “the gravest conflict between federal and state authority since the Civil War,” a crisis that on September 30, 1962, exploded into a chaotic battle between thousands of white civilians and a small corps of federal marshals. To crush the insurrection, President John F. Kennedy ordered a lightning invasion of Mississippi by over 20,000 U.S. combat infantry, paratroopers, military police, and National Guard troops. Based on years of intensive research, including over 500 interviews, JFK’s White House tapes, and 9,000 pages of FBI files, An American Insurrection is a minute-by-minute account of the crisis. William Doyle offers intimate portraits of the key players, from James Meredith to the segregationist Mississippi Governor Ross Barnett, to President John F. Kennedy and the federal marshals and soldiers who risked their lives to uphold the Constitution. The defeat of the segregationist uprising in Oxford was a turning point in the civil rights struggle, and An American Insurrection brings this largely forgotten event to life in all its drama, stunning detail, and historical importance. William Doyle’s previous book, Inside the Oval Office: The White House Tapes from FDR to Clinton (1999) was a New York Times Notable Book. In 1998 he won the Writers Guild of America Award for Best TV Documentary for the A&E special The Secret White House Tapes, which he co-wrote and co-produced. He lives in New York City. His email address is billdoyleusa@yahoo.com.